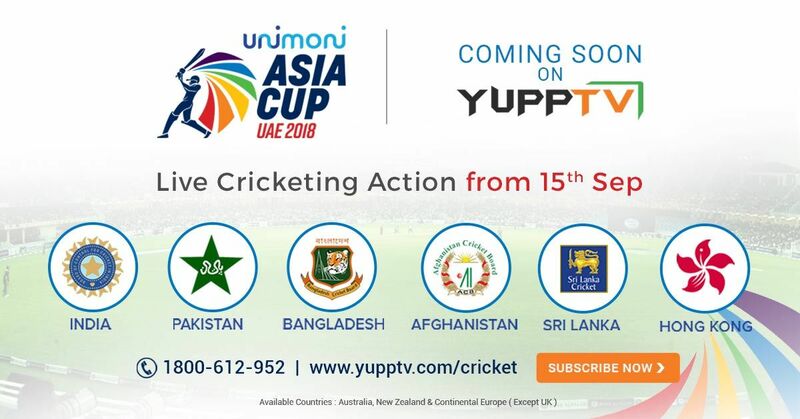 YuppTV bagged exclusive digital rights for Asia Cup 2018 Live Streaming in Australia, New Zealand, and all countries under Continental Europe. Commencing on the 15th of September, the Asia Cup 2018 will host dynamic cricketing action between India, Pakistan, Sri Lanka, Afghanistan, Bangladesh and the winner of Asian Cricket Council qualifier, till the 28th of September. Star network holding the telecast rights of 2018 Asia cup, Hotstar will stream all matches in India. Asia Cup will be held in Abu Dhabi and Dubai. Cricket lovers can subscribe for the series at www.yupptv.com and watch the action live on YuppTV. Asia Cup 2018 participating teams are India, Pakistan, Sri Lanka, Bangladesh, Afghanistan, and Hong Kong. Group A comprises of India, Pakistan and Hong Kong. Indian team is led by Rohit Sharma, Sri Lanka by Angelo Mathews, Pakistan by Sarfraz Ahmed, Bangladesh by Mashrafe Mortaza, Afghanistan by Asghar Afghan and Hong Kong by Anshuman Rath. we can watch an India VS Pakisthan match after a long through 2018 Asia Cup through Hotstar, Jio TV, Yupp TV etc. Subscribe to the Asia Cup Package to watch all the matches Live in HD on YuppTV. One can also watch the matches on Smart Televisions, Smartphones, Tablets and Gaming Consoles using YuppTV App. Check out our packages page to Subscribe Now. Download the YuppTV App for iOS and Android to Watch Asia Cup 2018 Live on Smartphones.